Two thick matte-white knots descend from the ceiling on taut golden straps. About head level, these neural forms sway gently as you pass, tempting visitors with a touch to send them drifting. From the floor rise three giant forms, one towering above head level, another snaking across the ground. When standing among them, Wilson’s sculptures feel imposing; positively jurassic. They fabricate an uncanny plane where mass, weight and form have only fleeting correlations. The term Welterweight describes a boxing weight class between lightweight and heavyweight. Like the boxers these sculptures evince a supple strength, a state of in-betweenness. They are lithe and rigid, perilous and settled. How are they achieving their stance? What gives them volume? Are they innards or outtards? A giant viridian knot with legs iridesces in the air - an engorged fly’s eye? It’s hard to tell. Made from vinyl, nylon and carbon fiber-skinned concrete, they are industrial models poised in organic drama. Their production is a performance in its own right, as Wilson will pour concrete into the hand sewn passageways, working them into somatic postures as they harden. Often featuring multiple collaborative limbs, they are stoic creatures yet aware of one another’s space. As fleshy, human-sized actors, these sculptures compete for presence with the very viewers that give them context. They perform on a stage set by the pre-existing works in the space, and as such make for an appropriate ending to a series focused on Exhibition Context. As they lean, lumber, strut, plod, cinch, stomp and squat, they prod us to reflect on our own corporeality and in turn feel a little deeper for the other bodies that surround us. Exhibition Context is a five-part series of additive solo shows designed to throw focus toward the gallery's embedded conditions of presentation. It serves to maximize individual artistic platform while encouraging a collaborative approach. 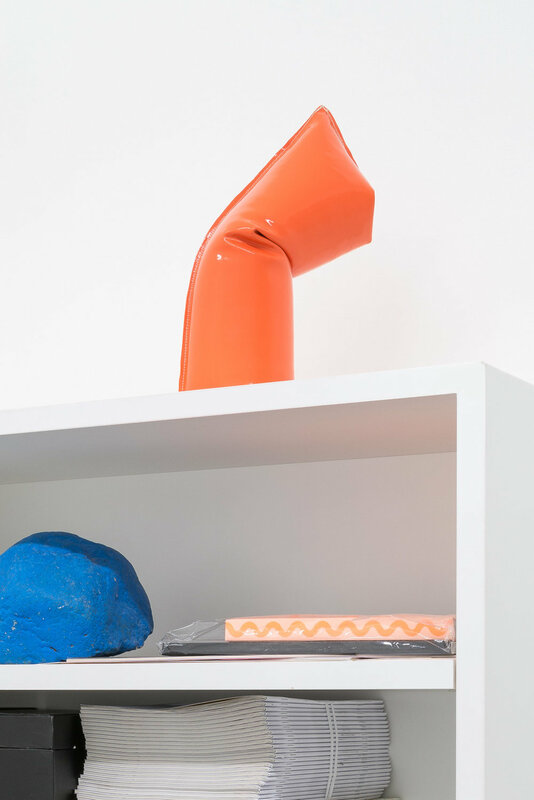 In this final show, Wilson has recontextualized works left behind by the first four artists: Paul Pescador, Linnea Kniaz, Ian James and Aitor Lajarin. May Wilson (b. 1986) is a San Francisco based artist working in sculpture and installation, from Hollywood, Maryland. She holds an MFA from UC Davis and a BFA from Maryland Institute College of Art. Recent exhibitions include Shulamit Nazarian in Los Angeles, BBQLA, Southern Exposure in San Francisco, Bass and Reiner in San Francisco, Aggregate Space in Oakland and the di Rosa Foundation in Napa. She has been awarded a Graduate Fellowship at Headlands Center for the Arts, and residencies at Skowhegan School of Painting and Sculpture, and Neu Kirche Contemporary. This year she was a finalist for the SFMOMA SECA award and is currently an affiliate at the Headlands Center for the Arts. She is included in the library collections at The Whitney Museum of American Art, and the Museum of Modern Art in New York and San Francisco. Sanctified! Bathe yourself in the waters of the slow-motion moment. An angel dissolving through the landscape. A sinner running from the dogs. Catching some countryside hangtime. A baywatch baptism. A redneck christening. Disturbing the peace in celebration of a forgotten holy water dropped from the heavens above. Accompanying Exhibition Context upstairs is Non-Cinema, downstairs. Non-Cinema is a series taking place in the basement of VACANCY dedicated to experimental video works, specifically the works of Spencer Holden, whose philosophy of Non-Cinema gives the project its title. Spencer Holden is an active ﬁlmmaker with a focus in experimental video, installation and performance art. He is now developing cinematic experiments towards a Non-Cinema. His work has been featured at REDCAT, Slamdance, Barnsdall Art Park and The Watermill Center. Spencer graduated from California Institute of the Arts in the Film and Video Program in 2013.